Triiodothyronine (T3) is the active form of thyroid hormone. Most T3 is produced outside the thyroid gland via deiodination of T4, with less than 20% being secreted directly from the thyroid. It is estimated that healthy adults produce about 30 ug T3/day, of which about 5 ug are secreted directly from the thyroid and the rest is produced outside of the thyroid parenchyma via T4 deiodination. D2 is thought to mediate the bulk of T3 production, approximately 20 µg/day, with a small contribution provided by D1 (5 µg/day). Relatively high D2 activity can be found in the brain, pituitary gland, brown adipose tissue (BAT), and heart. In contrast, D1 expression is restricted to the liver and kidney where it also processes conjugated T3. Most T3 in human serum is bound to carrier proteins, while less than 0.4% of T3 is free. 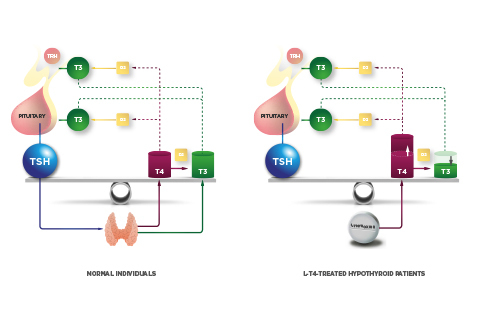 Ideally, one would prefer assessing circulating free T3 (FT3) levels as they provide information about the level of T3 that is available to enter cells and initiate thyroid hormone action. However, measuring serum FT3 levels is labor intensive and requires equipment not readily available in most clinical reference laboratories. The majority of all commercially available assays utilize an alternative approach to analyze FT3 concentrations directly in the presence of proteins (unfractionated samples of serum). This “direct FT3 method” is subject to interference and lack specificity. It is not clear that using a direct FT3 assay offers any clinical advantage over measuring serum TT3 levels. Serum T3 concentration exhibits minimal circadian rhythmicity, remaining remarkably stable throughout the life of a healthy adult individual. Low serum T3 levels are generally observed in the event of starvation or systemic illness. Thus, the pool of circulating T3 is stable and provides a steady supply of T3 to all tissues. The mechanism that preserves plasma T3 is the negative feedback loop between circulating thyroid hormone and the neuroendocrine system (hypothalamus and pituitary gland). Small drops in plasma levels of T4 and/or T3 rapidly activate the secretion of hypothalamic thyrotropin-releasing hormone (TRH) and pituitary thyroid-stimulating hormone (TSH), which stimulates the thyroid gland to secrete T4 and T3 and restore plasma levels of these hormones. T3 (an not T4) is the circulating molecule that inhibits the TRH and TSH genes by entering pituitary TSH-expressing cells (thyrotrophs) and/or TRH-expressing neurons in the medial basal hypothalamus (PVN), respectively. In contrast, circulating T4 must be converted to T3 via D2 both in the pituitary gland and the medial basal hypothalamus in order to activate the negative feedback mechanism. Accordingly, D2 is highly expressed in the thyrotrophs. In the hypothalamus, D2 is expressed predominantly in tanycytes, specialized ependymal cells lining the floor and infralateral wall of the third ventricle. Locally produced T3 exits tanycytes and enters TRH-expressing neurons in the paraventricular nucleus. In fact, tanycytes and TRH-expressing neurons are intermingled in the external zone of the median eminence, providing the physical proximity for D2-mediated feedback signaling. D2 is also expressed at low levels in astrocytes contained in the medial basal hypothalamus, but this pool of D2 is not thought to play a significant role in the T4-mediated feedback mechanism. However, it could play a role in energy homeostasis, promoting food intake and energy preservation. The expression of D2 in the medial basal hypothalamus is upregulated by cytokines and nutritional signals, explaining at least in part the decreased in TRH expression observed during systemic illness and fasting, respectively.